At its Build developers conference in April this year, Microsoft announced "Project Islandwood" - the "Windows Bridge for iOS" that lets iOS and Android developers port their apps to Windows. Microsoft finally made another surprise move on Thursday by open sourcing an early version of its toolkit for iOS to help iOS developers move their apps more easily to Windows 10. The source code for an early preview of "Windows Bridge for iOS" is now available on GitHub under the MIT open-source license. By releasing the preview of iOS Bridge, Microsoft wants the open-source community to contribute code, comments, testing, vulnerability reports, before the company launch the final version later this fall. The iOS Bridge enables developers to create apps that work with both Windows 8.1 and Windows 10 operating systems. Currently, Microsoft only targets the standard X86 and X64 processor architectures, but by the end of this year, the company will add support for ARM-based systems, specifically for mobile devices. 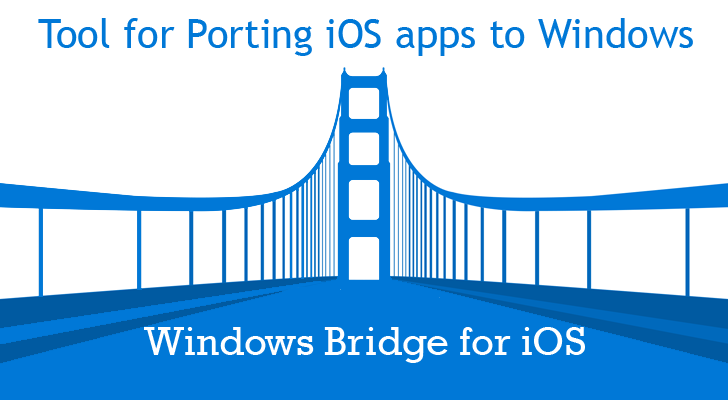 "Our goal with the iOS bridge has never been simply to run iOS apps on Windows," explained Salmaan Ahmed, the product manager on the Windows Bridge for iOS team. "Rather, our goal is to help you write great Windows apps that use as much of [developers] existing Objective-C code and knowledge as possible. We will, of course, continue to work to expand our iOS compatibility." Alongside "Project Astoria," now called Microsoft's Android bridge, is currently available as a technical preview by invitation only and will be released as a public beta at the end of the month. Both the toolkits are aimed at making it easier for app developers to bring their existing code to universal Windows apps. Although Android bridge is limited to just mobile phone apps, iOS Bridge will let developers build apps that work on PCs, tablets, and mobile devices.